Here's the ultimate list of best WiFi adapter for PC to help you to pick the right product. Obviously if you're assembling a desktop PC, it's much wiser to add a WiFi card. Also many old PC doesn't have any WiFi card, and running Ethernet cable is not always easy. So, you might be looking for a descent WiFi adapter for PC to avoid the cable clutter. First, let's take a look at some basic facts and FAQ about WiFi cards. What you should check before buying? Of course you'll find many WiFi adapter for desktop, but all of them are not suitable for you. There's few essential parameter you must check before buying. PCIe WiFi cards or USB WiFi adapters? Basically there's two choice while choosing the best WiFi adapter for PC, PCIe cards and USB cards. PCIe cards- Generally PCIe cards deliver better stability and performance compared to USB WiFi adapters. They have much better capability to dissipate heat, packs better WiFi chipset. Also better range due to dedicated external antennas. But it's not very convenient to just pull out PCIe cards and plug in into another PC. You've to open up the entire desktop case to access the cards. USB cards - On the other hand, USB WiFi dongles are much easier to remove and use on another PC. In most cases they're just plug and play. But generally they lack the performance compared to PCIe cards. As the WiFi chipsets are not of that great quality. Also there's a speed limitation due to USB protocol and length of USB cable. Due to their relatively smaller size, most USB WiFi adapter have a crappy antenna. There's another advantage, you can't easily add another WiFi card to the modern laptops. The easiest option left is to use the USB adapters. Another big issue related with any WiFi adapter. You might face driver issue with many newer WiFi cards. In most cases, the manufacturer provide a working driver for Windows and mac OS. But that's not the case with Linux. Many time you've to build the linux driver yourself for the particular WiFi adapter. So, check carefully about the driver compatibility before buying any product. No one likes a slow WiFi connection. So, speed is also an important factor. WiFi has many different speed category and frequency band. The most used protocols are 2.4 GHz 802.11 b/g/n and 5 GHz ac. Generally speaking, 5 GHz ac WiFi provides more than double speed compared to 802.11 b/g/n network under most scenario. But the 5 GHz ac WiFi support must be on both the router and PC to take advantage of it. MIMO is also an game changer. It means there's more than 1 antenna on the both WiFi devices. Which can dramatically improve speed. As example, a single antenna 2.4 GHz b/g/n could deliver maximum speed of 150 Mbps, theoretically. While with 4 antennas, it could theoretically reach 600 Mbps. This type of multiple antenna setup is called MIMO. In this case it's 4:4x4 MIMO. Here's the fact. Always expect about half of the maximum advertised speed. No matter how costly the WiFi hardware is. Range and coverage of any WiFi network depends on many factors like WiFi band, output power, receiver sensitivity, antenna gain and type of antenna. Also depends on channel bandwidth and modulation technique. As example if the WiFi is operating on 802.11b mode, it provides better coverage compared 802.11n, however maximum speed is less. 2.4 GHz WiFi has better range compared to a 5 GHz WiFi network. At least 50% more. 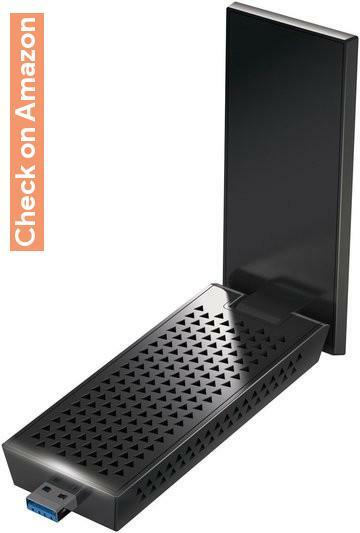 As the WiFi transmit power is very limited, antennas play a huge role in range. General rule of thumb is bigger the antenna, better the coverage. However that's not the case always. There's many type of antenna with different purpose. Like a parabolic reflector antenna almost is useless for short range. WiFi is the easiest way to ditch the ethernet cable and make the internet connection wireless. But all the cards/adapters are not same, you may not settle down with a particular product. Without further ado let's get started with the list of best wireless adapter for PC available in 2019. Arguably one of the best adapter with a reasonable price tag. This dual band adapter has a theoretical speed of up to 1900 Mbps, when tested with proper conditions. But in reality, it hardly reaches around 600 to 700 Mbps with the best gears. Actually that's pretty good speed for a consumer grade desktop WiFi cad. Note: You should keep in mind that there's a little driver issue on Windows 10. In most cases, an updated version of Windows could fix this problem. However on Linux, the propitiatory Broadcom wl driver works just fine, as reported by several users. So, if you're looking for the best wifi adapter for desktop, easily it could be your choice. 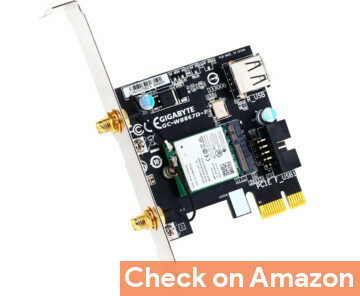 Currently the most advanced and high quality PCIe WiFi adapter you could buy without breaking the bank. 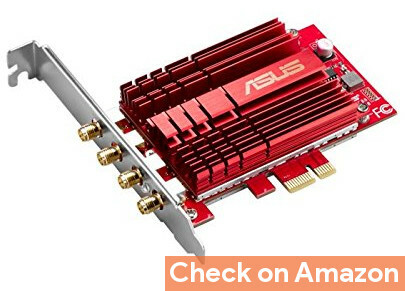 With it's four 4:4x4 MU-MIMO antennas, and 1024 QAM modulation, the ASUS PCE-AC88 could theoretically reach up to 1000 Mbps on 2.4 GHz band and 2100 Mbps on 5 GHz band. These numbers are insane for a home WiFi network. 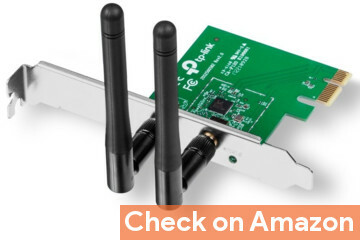 This card has 4 detachable antennas with a separate antenna dock. Where you can position the antennas with different orientations to get better range. ASUS PCE-AC88 is quite well built and thermally stable. You could notice the huge heatsink over the metal cover, adequate passive cooling keeps it cool enough under such high speed and load. Anyway you're looking for the best of the best wifi adapter for desktop, clearly this is for you. Though it's not a very cheap product, but the price is justifiable for premium features. A cheap yet quite high quality product from a reputed company, Gigabyte. Unlike the previous two products, this card has a Intel WiFi chip with integrated dual band WiFi and Bluetooth. A little about the speed, with the 2.4 GHz band, WiFi speed could reach up to 300 Mbps, and on the 5 GHz band it's maximum of 867 Mbps. It also packs an integrated Bluetooth 4.2 radio, which should deliver much better performance compared to a separate USB Bluetooth adapter. There's a separate detachable antenna, which you can place somewhere else an arrange in different orientations to get better coverage. As you might have noticed, this card is a quite modular design. There's a M.2 mini PCIe WiFi card, attached to a larger PCIe career board. Which you could use to test spare M.2 cards in future. Unfortunately there's no Linux support for this card till now. Which is a downside. Besides all, it could be a good choice of wireless card for desktop if you want a WiFi card with integrated Bluetooth. This is a fairly old model card, but there's a reason behind including the TP-LINK TL-WDN4800 in the list. All the cards mentioned above, has either Broadcom, Intel or Realtek WiFi chip. But this one has a WiFi chip from Qualcomm, offers excellent Linux support. The maximum speed of this adapter is 450 Mbps, both on 2.4 GHz and 5 GHz bands. Though this adapter is dual band, but doesn't support the 802.11 ac protocol, the 5 GHz band is only for legacy 802.11 a . The chip inside this adapter has very good support for Linux, and allows various tweaking. 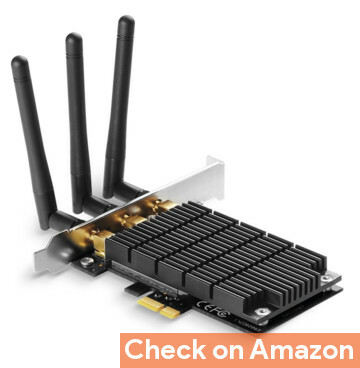 So, if you're planning to primarily run a Linux distro, this could be the best WiFi adapter for hacking and other WiFi security related purpose. Another product from ASUS, for it's relatively lower price and reasonable performance. 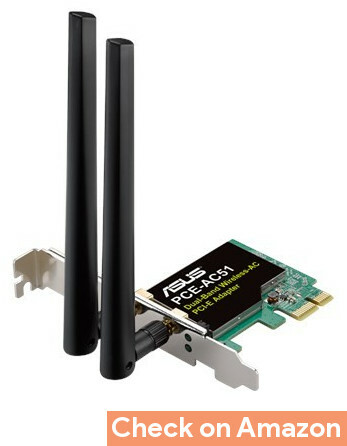 This WiFi adapter has a Realtek RTL8812AE WiFi chip, which has a good driver supported on Windows and Linux, just a matter of adding the card to a spare PCIe x1 slot and start using it. Like other ASUS products, this one is also quite well built. There's a metal shielding over the PCB which minimizes EMI interference and provides some passive cooling. 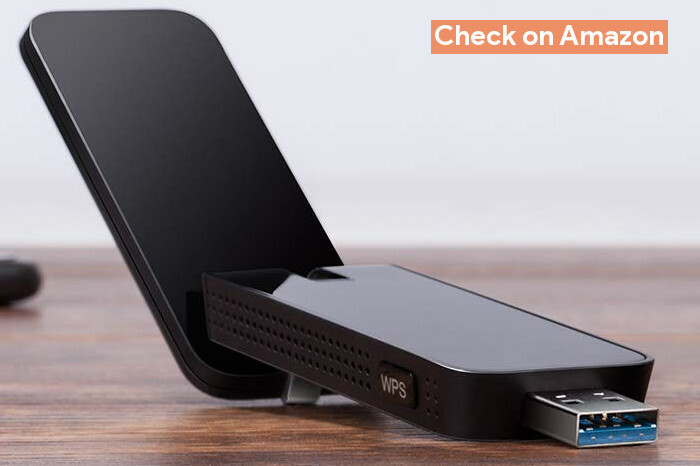 So, if you're looking for a cheap yet quality top WiFi adapter for PC in 2019, this could be the perfect product for you. The cheapest adapter by far in this list. It's not a dual band adapter, supports only 2.4 GHz WiFi. There's nothing special about this adapter, good enough build quality as a daily driver. There's no issue with the WiFi chip, and driver support on Winows and Linux is great. 2 external detachable 3 dBi omni antenna delivers more than enough range. So, if crazy speed and 5 GHz WiFi is not your priority, could be a good choice. Overall a good card with a lower price tag. USB adapters are much more convenient to use across different PC or laptop compared to PCIe cards. On laptops, you can't even attach a PCIe card easily. Actually there's literally tons of such adapters, some from reputed manufacturers like Netgear, TP-Link, D-Link, others are mostly re branded Chinese products. Even though both the cheap and costly adapter may use the same WiFi chip, but almost always the branded adapters performs better and lasts longer. So, here's a list of best of the best USB WiFi adapter from different price range and different features to clear the doubt. Again another product from TP-Link. 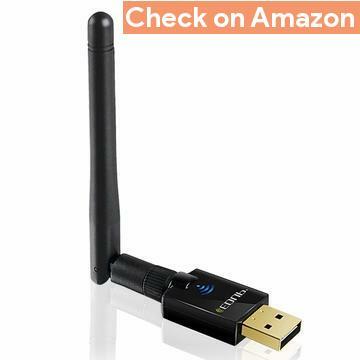 This USB WiFi adapter uses the latest RTL8814AU chip from Realtek, delivers excellent speed. The chip used in this adapter is fairly new. Thankfully both Realtek and TP-Link provides proper drivers for Windows and mac OS, which can be downloaded and installed. However there's no ready made driver for Linux. You've to compile the driver kernel modules yourself, even sometimes you need apply few patches to the driver. 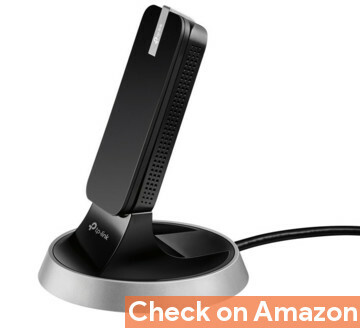 The build quality is above average, and there's a USB dock with long cable for placement and usage convinced. The antenna is attached to the main casing, can't be removed easily. 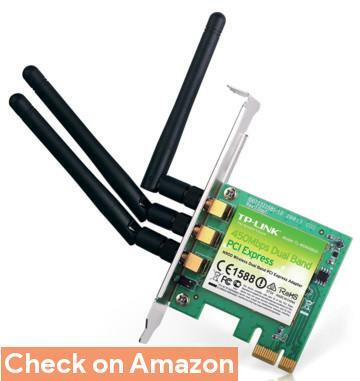 Overall this is a very good product, could be the best WiFi adapter for desktop at this price range. Netgear WiFi products are great, however they're bit costly compared to others. The Netgear NightHawk A7000 is almost same compared to TP-LINK Archer T9UH above, but with a bit better build quality and higher price tag. Like any other RTL8814AU based WiFi adapter, driver support is not very good on Linux. So, be prepared for some troubleshooting and tweaing if you're aiming to use it on Linux. Arguably the NightHawk A7000 got the best aesthetics and build quality among all the products. The clear cut edged casing is just killer in terms of looks. With it's awesome build quality and excellent performance obviously with a higher price tag it clearly stands out of the crowd. So, if you're willing to pay few extra bucks for the best build quality and performance, this is the best USB WiFi adapter for desktop. 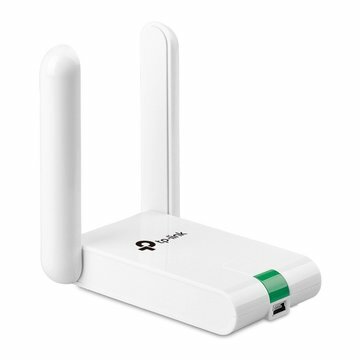 Another high quality dual band WiFi adapter from TP-Link, around the $30 range. Again this adapter also uses the Realtek chipset, RTL8812AU. Build quality and physical appearance is about the same of TP-Link T9UH, just uses a little weaker WiFi chip. I've to say this adapter is definitely the budget king of USB WiFi dongle, packs the right amount of performance, power and pricing. If you're comfortable with voiding the warranty, you could pry open the case and connect a larger antenna to the inbuilt u.FL connectors. The cheapest dual band WiFi adapter for PC so far in this list. Despite being quite cheap it preforms quite well, and the wireless range is satisfactory too. Maximum speed on this device is 150 Mbps over 2.4 GHz band and 433 Mbps over 5 GHz band. The WiFi chip used here, RTL8811AU is well sported on Linux, mac OS and Windows. Here you can download the drivers. So, it's quite a good adapter based on user reviews and performance. There are many other good products left behind in this list. 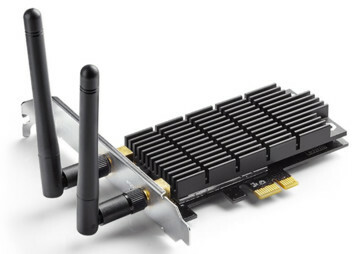 Also DIY PCIe wireless adapters could be a very good choice if you're comfortable with tweaking. Hope this list of best WiFi adapter for PC makes sense. Frankly I've not tested all the products myself, I've tried my best to choose the right products from my previous experience and user reviews from various forums.